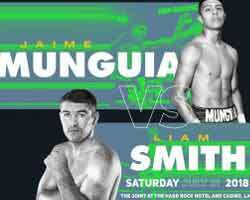 Review by AllTheBestFights.com: 2018-07-21, nice and heavy exchanges between Jaime Munguia and Liam Smith: it gets three stars. The undefeated current Wbo light-Mw champion Jaime Munguia entered this fight with a perfect record of 29-0-0 (25 KOs=86%) and he is ranked as the No.4 super welterweight in the world (currently the #1 in this division is Jarrett Hurd). He has already fought three times in 2018 winning over Jose Carlos Paz (Jaime Munguia vs Jose Carlos Paz), Johnny Navarrete and Sadam Ali (Sadam Ali vs Jaime Munguia). His opponent, the former Wbo light-Mw champion Liam Smith, has a boxing record of 26-1-1 (14 knockouts) and he entered as the No.7 in the same weight class. He suffered his only loss when he faced Saul Canelo Alvarez in 2016 (Canelo vs Smith), after this bout he fought three times in 2017 beating Marian Cazacu and twice Liam Williams (Smith vs Williams I and Liam Smith vs Liam Williams II). Munguia vs Smith is valid for the WBO World super welterweight title (Munguia’s first defense). Watch the video and rate this fight!